Title: 11/10/1988 - Lift trucks or other machines found in the workplace are not containers for labeling requirements of the HCS. This is in response to your letter of October 25, regarding clarification of the Hazard Communication Standard (HCS) 29 CFR 1910.1200 container labeling requirements. The term container as defined in 29 CFR 1910.1200(c) means any bag, barrel, bottle, box, can, cylinder, drum, reaction vessel, storage tank or the like that contains a hazardous chemical. 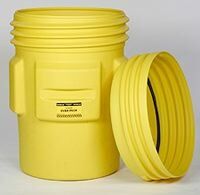 The definition specifically states that pipes or piping systems, and engines, fuel tanks, or other operating systems in a vehicle are not considered to be containers. Therefore lift trucks would not be considered a container for purposes of the HCS and would not require labeling regarding hazardous chemicals used to operate them. This does not exempt such chemicals from coverage by the rule; it simply eliminates the need to label once they are placed in the vehicle. Other machines found in the workplace that may contain hazardous chemicals do not fall under the definition of container, therefore the machine components would not have to be labeled according to the HCS. If there is the potential for exposure to the hazardous chemicals associated with these machines, the article definition would also not apply and these chemicals would be covered by the rule. Again, the need to label the machine components once the hazardous chemicals are in place is eliminated. Process equipment however, which incorporates containers as defined by the HCS, such as mixers and blenders, must be labeled according to the rule. The employer may use signs, placards, process sheets, batch tickets, operating procedures, or other such written materials in lieu of affixing labels to individual stationary process containers, as long as the alternative method identifies the containers to which it is applicable and conveys the information required by paragraph (f)(5) of the standard. We appreciate the opportunity to address your concerns. Please do not hesitate to contact us again if you have further questions.